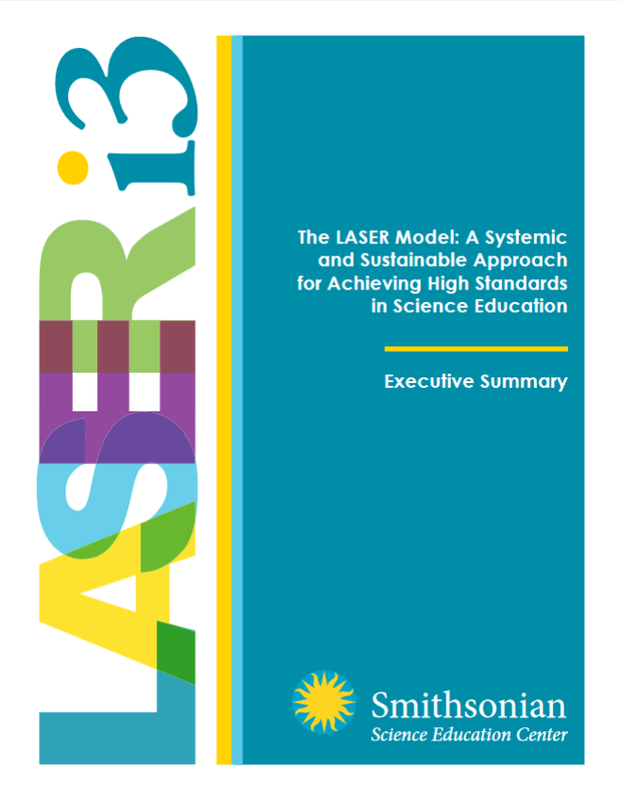 In 2015 and 2017, researchers published the findings from a 5-year U.S. Department of Education Investing in Innovation (i3) validation study to evaluate the LASER model’s efficacy in systemically transforming science education. 1. 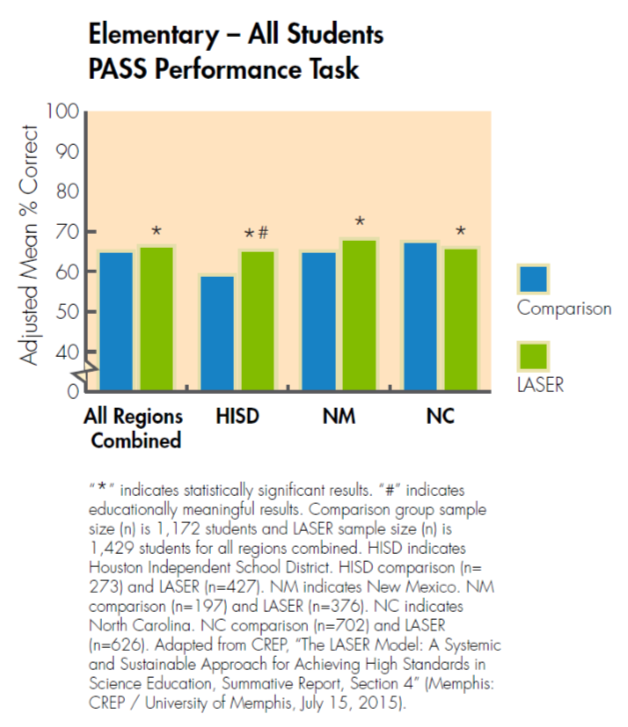 LASER students showed statistically significant gains on the Partnership for the Assessment of Standards-Based Science (PASS) performance assessment relative to the comparison group. These gains indicate students are able to apply what they have learned to novel hands-on tasks. 2. The effects were particularly high for subgroups of students who are most in need. When the data are disaggregated, statistically significant gains in science are also seen by LASER students identified as English language learners (ELL), students with individualized education programs (IEPs), or students participating in free or reduced price lunch (FRL) relative to the comparison group. 3. 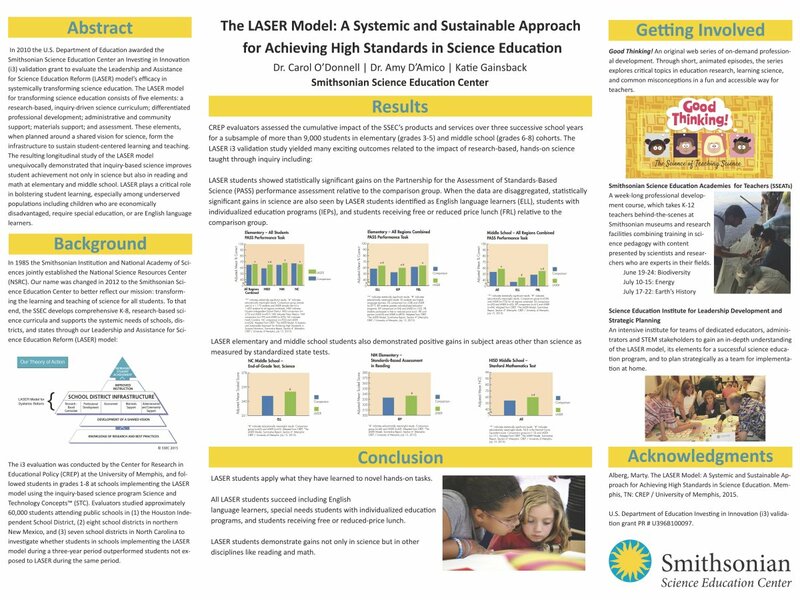 LASER elementary and middle school students also demonstrated positive gains in subject areas other than science as measured by standardized state tests. In the Houston Independent School District for example, LASER middle school students outperformed their peers with statistical significance in both math and reading. 4. After receiving three Science and Technology Concepts™ units and accompanying professional development (PD) by the SSEC, 64.7% of LASER teachers reported feeling “well prepared” or “very well prepared” to teach inquiry-based science relative to only 44% of teachers at comparison schools receiving PD as usual. What did we learn about LASER student outcomes? The LASER i3 study resulted in many statistically significant and educationally meaningful improvements in achievement in science as well as in reading and mathematics. 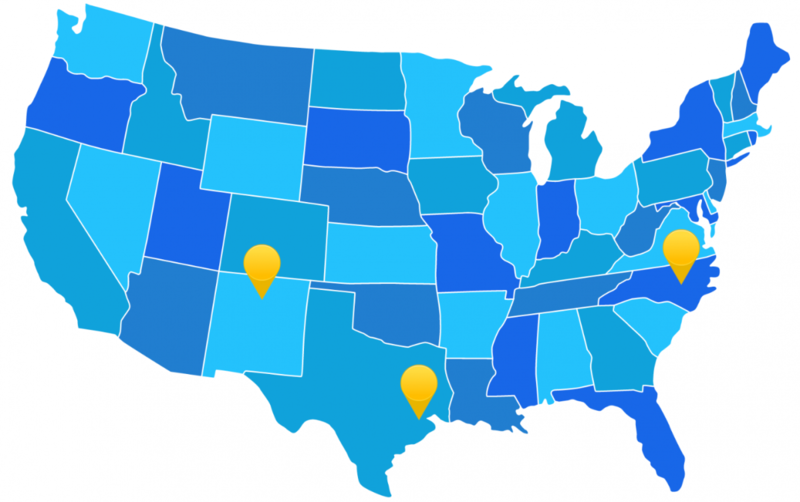 To compare students across all three regions, schools administered the Partnership for the Assessment of Standards-Based Science (PASS). 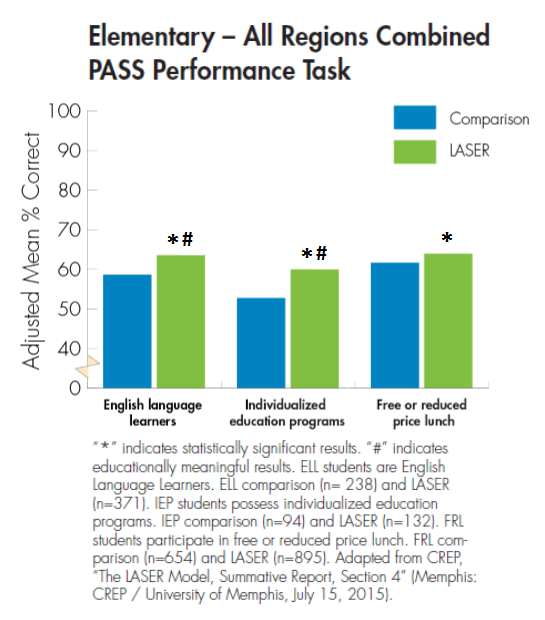 The strongest gains by LASER students relative to the comparison group were seen in hands-on performance tasks. These gains are particularly noteworthy as they indicate students are able to apply what they have learned in science to hands-on tasks, just as professional scientists apply their expertise to conduct investigations and solve problems. 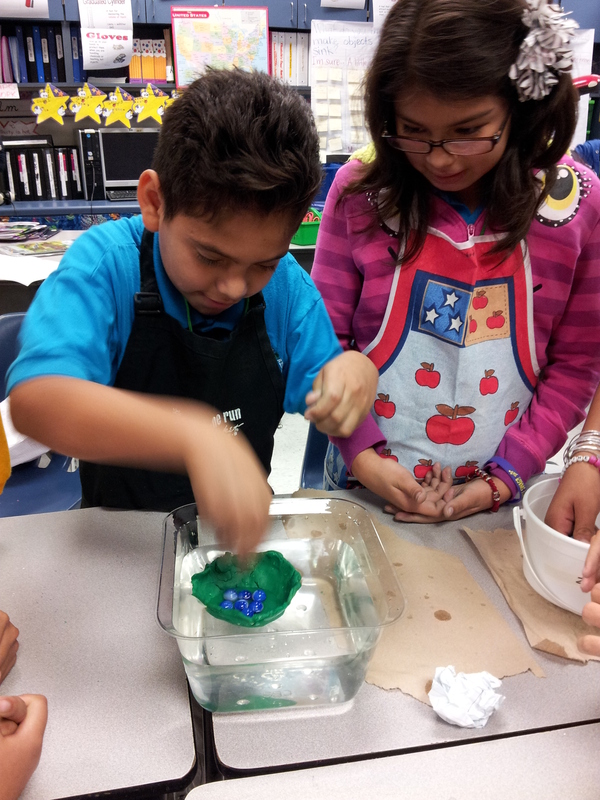 "Science is fun, active, and hands-on." 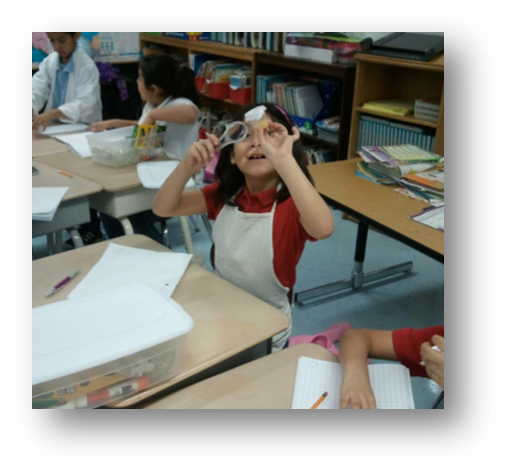 Students can’t wait for science! How did teacher practice change as a result of LASER? Participating LASER teachers at grades 1–8 received a Science and Technology Concepts (STC™) unit each year for three years. 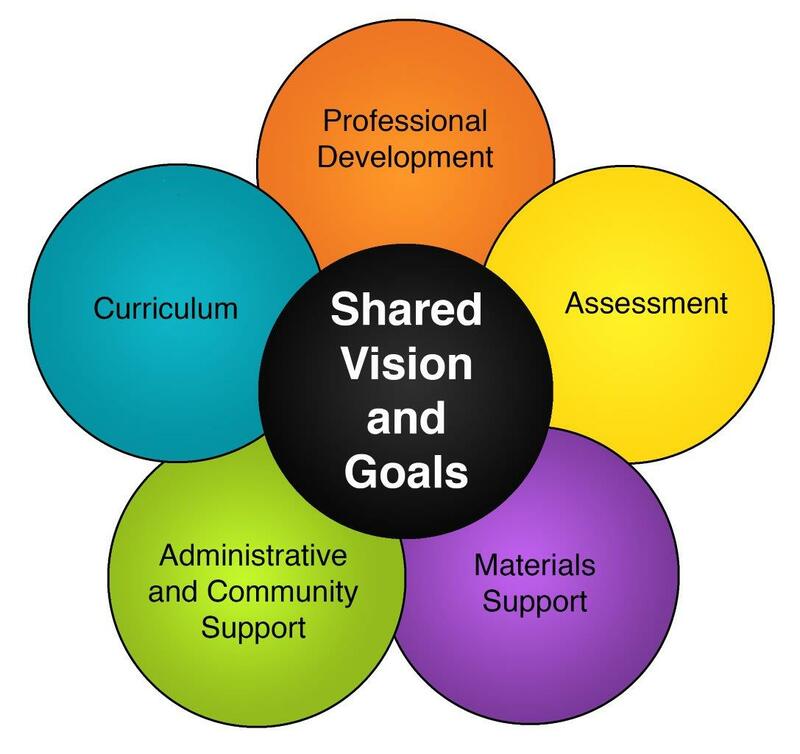 This curriculum was accompanied by another integral part of the LASER model: professional development (PD). Teachers received two trainings in each unit to practice pedagogical strategies and gain deeper content knowledge for successful implementation. LASER teachers found these ongoing PD opportunities useful to improve their own knowledge and skills as well as preparing them to implement the curriculum. In 2014, evaluators asked teachers, “How useful to your science instruction was the professional development you received last year?” Of LASER teachers receiving the SSEC’s PD, 67.6% found it “very useful” while only 23.1 % of teachers in the comparison group said the same of their school district’s PD. A North Carolina LASER teacher examines a specimen at professional development training in the STC™ unit The Life Cycle of Butterflies.